Easycooking: A medley of dishes!! A medley of dishes with sweet memories!! Yup,I had been to Kerala-Ernakulam precisely,for a week and just cant stop talking about it.Even though its just an overnight journey from Chennai,for me it would always be far..and I so much look forward to going there.This time it was a sudden trip with RaC tickets which got confirmed at the last moment..thank God for small mercies;). Cooking was obviously the last thing on my mind and the last thing I did while I was at home with amma.By the time I got up and came down,breakfast and prep work for lunch would be over.All I did was eat,sleep and have fun with Pluto.It was raining non-stop daily while I was there and I enjoyed every bit of it.Had those long long chatting sessions with amma..how I missed that;).Amma cooked up every favorite dish of mine and I have put on at least a couple of kilos in a matter of few days..;). Here are a few dishes which amma cooked especially for my blog since I had asked her for some long-forgotten Konkani dishes. 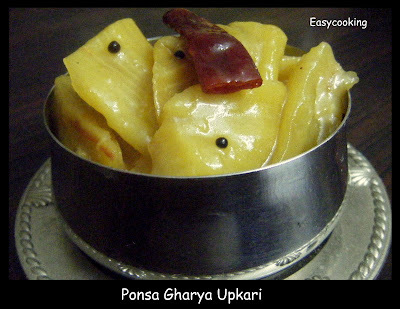 Ponsa Gharya Upkari – Ripe Jackfruit stir fry. There are a few dishes which usually gets cooked during the jackfruit season and at amma’s place,this was a regular since after a while people did get tired of the overtly sweet jackfruit.Of course,nowadays this has become a rare dish since people buy cut fruit and it is enough for a tasting session and not more.A simple upkari which can be had as a snack as well as with lunch. In a kadai splutter mustard seeds and add red chilly.Add the cut jackfruit pieces,jaggery to taste[only a little bit] and salt.Stir well till the jaggery melts. Very similar to fruit raita.Another one of my favorites after Banana muffins.One of the fruits I rarely eat,banana has become a regular in my cooking.Easy to whip up and tasty too. Chop banana into small cubes.Prepare seasoning in a kadai-splutter mustard seeds,add curry leaves and green chilly bits.Whisk the curds and add a pinch of salt.Mix everything together while serving.Serve chilled. One of the recipes we saw in the latest edition of Vanitha.Oh yeah,I remember-I did cook breakfast one day..had tempted amma so much about my Poori-Aamras combo.While making this,we prepared this quick bhatoora too.An easy version which does not require any resting time. Cook potatoes till mushy.Mash till no visible lumps remain.Mix in maida-do not add water.Make a smooth batter.Roll out pooris/bhatooras and deep fry in hot oil.Serve hot with channa. lovely dishes...nice idea of making bhaturas..
never tried ripe jackfruit stir fry, looks delicious! The jackfruit and raw banan dishes are new to me. Looks delicious. 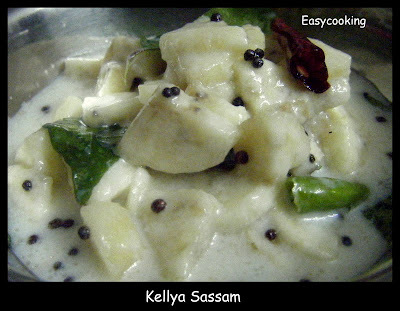 That sassam is something I make often, and is a favourite of my husband's. Wow you had fun girl..Everything looks yummm. Loved the idea of adding potato to the bhatura. Lovely spread of new dishes divya@!!! First two dishes are new new to me. I envy you! Hmm....sounds like a fun vacation. Lots of simple, good dishes. Lovely dishes, I especially loved the idea of ripe jackfruit stir fry, looks so inviting ! Nice array of dishes. Never tried ripe jackfruit dishes. Looks nice. Poori aam ras is mine and childrens favourite combo.